Washington, who leveled widespread sanctions against Russia in an increasingly tenuous bid to isolate and undermine the stability of Moscow, has found itself humiliated and backtracking as it lifts bans on Russia’s RD-180 rocket engines. And even as Washington does so, the US media finds itself still painting Russia as a villain even as the US finds itself forced to buy rockets from a nation it claims invaded Crimea, is fostering a “hybrid war” in eastern Ukraine, and is bombing US-backed “rebels” in Syria. It is worth mentioning that Russia’s RD-180 rocket engines, possessing unparalleled performance US firms have yet to match, will be used to launch payloads into Earth orbit for the US Department of Defense. After Russia invaded Crimea, Congress swore off Russian rocket engines. But its ban on using these rockets to launch military payloads into space was perhaps a bit too hasty. A new bill approved by Congress has found a way to nullify the ban. 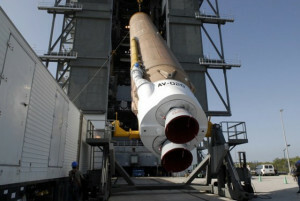 United Launch Alliance (ULA), a joint venture of Boeing and Lockheed Martin that has long been the primary contractor for launching Defense Department payloads into space, relies on the Russian-made RD-180. ULA recently declined to bid on a launch contract due to its limited supply of rocket engines, and the Pentagon is not happy. Though ULA is developing a new engine, the BE-4 is years away from reaching the launch pad. This is, after all, rocket science that we’re talking about. While Russia did not in fact “invade Crimea,” Popular Science is correct in pointing out that a ULA-made replacement for the Russian RD-180’s is years from becoming a reality. ULA has long had a monopoly on military payload launches. SpaceX recently got permission to use its Falcon 9 rocket to launch military payloads as well, right around the time ULA dropped out because of the ban. If the ban is lifted, it means ULA and SpaceX will take part in the first competition for a military launch since 2006–and that could translate into savings for the U.S. government. Ironically, a desire by ULA (a joint venture between defense industry giants Boeing and Lockheed Martin) to maintain their monopoly and all the unwarranted power and wealth associated with it, has forced them to do business with one of the nations it and a collection of other special interests on Wall Street, in Washington and in London have been attempting to undermine, divide and destroy for decades. SpaceX seeks to disrupt and decentralize the aerospace industry, a direct threat to Boeing and Lockheed Martin both in short-term and long-term regards. And it seems that both in short-term and long-term regards, the strategy of these special interests on Wall Street, in Washington and in London, is incoherent and self-defeating. As it attempts to isolate and undermine Moscow, it finds itself threatened by disruptive business models and innovators at home in America. To tamp down domestic competition, these interests have ended up rolling back sanctions against foreign competitors. Impotent and incoherent, it appears that the US has managed to do more harm to itself than to Russia. While Russia is certainly suffering from sanctions, should it overcome them, it will come out stronger and more self-sufficient on the other side. For the US however, win or lose against Russia, it is clearly harming itself in the process. For the global public looking on, flooded daily with news and op-eds about how much of a threat Russia is to global peace and stability, the fact that the US Department of Defense is still essentially buying rockets from Russia to put American satellites into orbit should serve as a reminder that nothing resembling actual principles, facts or honesty guides US foreign policy or how it is presented across US and European media. If the US finds itself unable to justify continued sanctions against Russian rockets, rockets used in vital roles for maintaining US defense capabilities, how is the US continuing to justify other sanctions against Russia that remain in place? Are these sanctions in place simply because the businesses being hurt by them across the West lack the lobbying power of Boeing and Lockheed Martin? And are we expected to continue believing Russia is such a “threat” but still America’s primary partner in launching defense satellites into space, not to mention American and European astronauts and supply missions to the International Space Station? In fact, flip-flopping on Russian sanctions seems like it should indicate to various stakeholders in Washington and London’s international order that it is looking less like an organized global enterprise, and more like a blind tropism seeking profits wherever it finds them, even if they are over the edge of a cliff. For these stakeholders, it may be time to consider divesting and/or diversifying into something truly looking with its eyes open toward the future and toward real progress.